YOLO (= “You Only Live Once”) seems to be a pervasive, recurring theme on social media. That I agree with some part of it, but also disagree with some of it. I DO believe one should make the most of one’s life. Life is about collecting experiences, having fun, and touching others in meaningful ways. Life is about growing spiritually. It is important to keep in mind that we are far more than that outer body of our human existence. We are a dense, material body, made up of organic tissues and structures, as well as a mind with the power to formulate and process thoughts and ideas, as well as a timeless soul/spirit. We may, in the course of our human experience, have forgotten, but we are indeed timless. 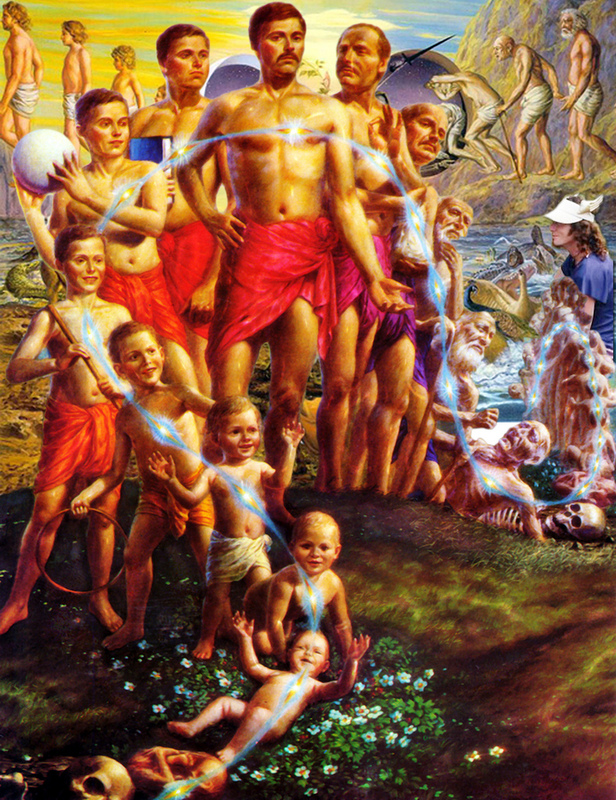 We have been around since the beginning of creation itself and will also continue to be around. Have you ever tried imagining NOT existing? You cannot do it. Every human being, prior to physical birth, specifically chose to inhabit a dense, material human body for a limited time, in order to seek out experiences from a human POV, with all the regular phyiscal limitations and challenges. We are born as infants, grow through childhood and adolescence, into and through adulthood, and eventually break down, die and rid our Selves of this outer shell and return to our true essense, and enjoy some much-needed R&R. Our Spiritual Essence, our “Higher Self” chooses if , when and why to split a portion or fragment of itself into a human existence for a while. This way it can experience things in the dense, physical 3-D world of earthly life. Life, as we know it, is nothing more than a tricked out Role-Playing Game, or “Sim”. It’s like those city-building or civiliation-building games where you control lots of little humans on your screen, each person performing a designated task, as you grow and develop your little empire. In essence, your spiritual Essence, your Higher Self, creates an “avatar”. Each and every lifetime in human form has a specific purpose, reason or motivation. As we complete each lifetime, our soul-fragment is return to our true Essence, along with all the experiences picked up along the way, in essence bringing back countless souvenirs and stories for further spiritual growth and expression. So while you are in this present, human existence, YES!, make the most of it. Try to have a full, rewarding and fun life! do (good) things, see things, experience things. Collect experiences and feelings. If it enriches your human experience in some meaningful way, then DO it. Don’t collect things just to have things. Don’t needlessly accumulate things or material wealth just to hord them away in some dark, secret place. Your limited human expression of Self presently does not remember when or how it will die, and when you do die, all your physicall “stuff” you have ammassed, you cannot take with you, once you part from your outer physical shell. So, to sum it all up, YOU in your truest form, are entirely formless, timeless and spiritual energy. Everytime you choose to experience human life it’s like visiting a theme-park. Park opens, you ride the rides, you eat the foods, you take in all the sights and sounds, then the park closes and you leave again. Can you go back the next day? of course you can, but your experience will be a different one. So using this theme-park analogy, in a sense, you DO live each day in the park only once, but you can choose how often you want to spend a day in the park…. so have fun out there! If you did not cover everything in 1 visit, don’t sweat it!!! You can always come back if you want. The Universe has hoooked you up with all-access passes.